So I'm called upon by the local AMCA chapter president to map and lead a one day mini road run as I spent alot of time out in the country along the Miss. river and knew every twist and turn. Just north of Memphis are miles of great traffic free smoothly paved roads through gentle hills and forested valleys. At this point I was riding about 20K miles a year on antiques; most of it on this and 2 other hand shift foot clutch machines so the miles between this starting point and that bucolic country side was not a challenge but many here may have ridden their machines maybe several times a year. So, the challenge was to find a route to the country from suburbia with minimal stops, none on an incline and only left hand turns. Many do not like operating a clutch with their left foot as they turn into a right hand corner. 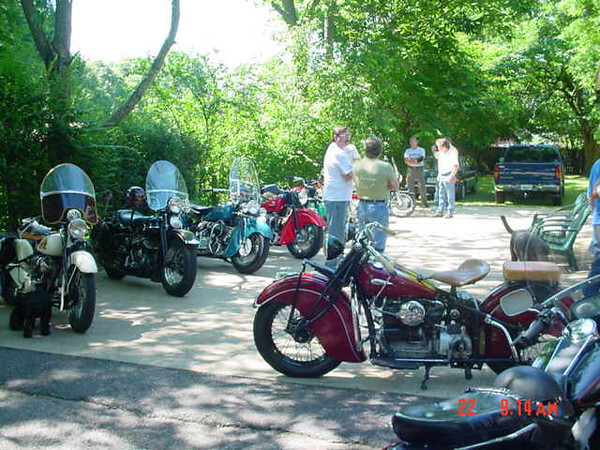 Visible are a 39 Chief; 46 Knuckle; AMCA Senior Winner 48 Chief; then 46 and 47 Chiefs. So our local chapter of the AMCA decides to have a miniroad run. Just north of Memphis are miles of great traffic free smoothly paved roads through gentle hills and forested valleys. At this point I was riding about 20K miles a yearmost of it on this and 2 other hand shift foot clutch machines so the miles between this starting point and that bucolic country side was not a challenge. Many here may have ridden their machines maybe several times a year. Sothe challenge was to find a route to the country from suburbia with minimal stops and only left hand turns. Many do not like operating a clutch with their left foot as they turn into a right hand corner. Visible are a 39 Chief46 KnuckleAMCA Senior Winner 48 Chiefthen 46 and 47 Cheifs.